Sticklebacks are small (up to 4 inch), teleost fish that live in marine and fresh water in temperate regions of the Northern Hemisphere. Sticklebacks and the tapeworms that infect them are often used in studies as models of the evolution of host-parasite relationships. It has been documented frequently that tapeworms can influence their stickleback hosts’ behaviour by making them swim near the surface and by dampening their natural response to seeing a predator. This is advantageous to the tapeworms because it improves their chances of reaching their definitive host, most likely a piscivorous a bird. Various parasites have long been known to influence host behaviour. Toxoplasma gondii has been linked to aggressiveness and impulsivity in infected humans as described in a previous blog. Cordyceps fungus, also covered previously, causes insects to climb to high areas and attach themselves to a plant to die. When the fungus sprouts out of the insect body the spores are able to travel further on the wind. Even the rabies virus, small particles only nanometres in size, cause the animal host to become more aggressive and more likely to bite, enabling transmission of the virus to another host. What was an unknown phenomenon is the ability of parasites to influence the behaviour of uninfected hosts as well. Nicolle Demandt and colleagues have demonstrated that when uninfected sticklebacks are in the company of infected sticklebacks they are more likely to exhibit the same risky behaviour as the infected individuals. These observations were made using laboratory experiments with the tapeworm Schistocephalus solidus and the three-spined stickleback, Gasterosteus aculeatus. This is a tapeworm that requires three hosts; a copepod, a three-spined stickleback, and a endothermic predator (e.g. water-dwelling birds), to complete its lifecycle. 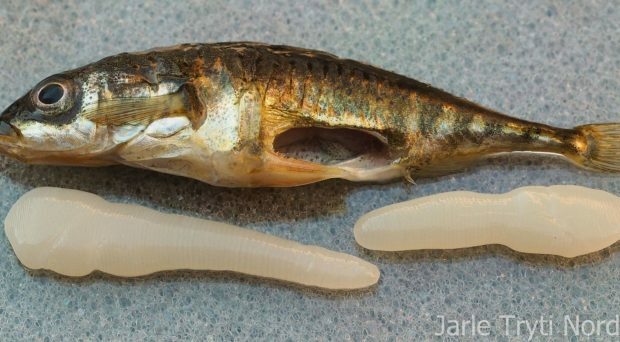 In the stickleback, the worm travels through the intestinal wall and develops in the body cavity where it grows large and depletes resources from the stickleback. The stickleback then needs more food, which is one explanation why those infected swim closer to the surface. The stickleback is then more likely to be eaten by a bird. 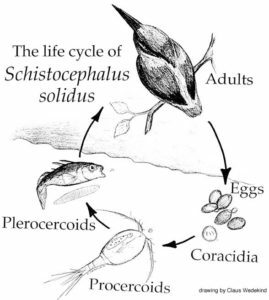 Inside the bird’s gut the tapeworm reproduces, and its eggs are passed into the water with the host’s faeces to be eaten by a copepod and complete the cycle. For the experiments, sticklebacks were transferred to tanks in groups of six, where the number of infected individuals was either zero, two, four, or all six. The bottom of the tank contained some foliage to provide shelter and therefore a safe region from any predators above. The predator’s presence was simulated by a model beak which could be hovered above the surface. Risk taking behaviour was recorded by observing at what level of the tank sticklebacks spent their time after an attack. They initially confirmed previous findings. The group of six infected fish spent more time in the dangerous zone than the group of six uninfected fish. They then observed that uninfected fish followed the behaviour of infected fish if there were more infected than uninfected fish in the group. In the group with two uninfected and four infected sticklebacks, the uninfected ones spent more time in the dangerous zone (alongside the infected fish) than when all the fish were uninfected or when there were only two infected individuals in the group. The uninfected sticklebacks seem to be prioritising their instinct to stay in a group above that to stay in a sheltered area. The authors note that the sticklebacks copied their infected conspecifics by exhibiting a quorum response: a trait whereby a behavioural decision is made if enough other members of the group display that behaviour. This system has presumably evolved because it affords the benefits that come with group behaviour, where individuals in larger groups have a lower probability of being predated. But staying in the shoal, if the shoal acts in such a risky way, may be detrimental when the majority are infected with this tapeworm. Is this advantageous to the tapeworm? It is quite likely that, either more fish at the surface will attract more birds, or perhaps a few birds would eat more fish each. In such a situation this behaviour manipulation, coupled with the shoaling response, causes the shoal to expose themselves; providing a cunning advantage for the tapeworms. Is it advantageous to sticklebacks? However, uninfected fish following infected fish might mean that the relative predation risk to an infected individual does not greatly increase. Since the probability of transmission is reduced when the number of infected fish at the surface is diluted, potential advantages to the tapeworm may be neutralised. This could eventually reduce the overall parasite burden for the shoal. But, of course, the evolutionary pressure would then act on the tapeworm to evolve a more innovative way of getting the infected fish to stand out. In fact, additional modulations have already been seen with infection causing the silvery sides of the fish to swell, making them more visible from above and infected fish preferring to stay on the edges of a shoal. So, although the extent of this advantage may differ in different ecological settings, it is a compelling example of yet another way in which parasites can manipulate their hosts to their own advantage. These findings also beg the question of what other social animals that use quorum response decision-making are also affected in this way by behaviour-changing parasites. Great post I have been looking this post for a long time and i have found one on your website. Thank You! Skye attained her BSc (Hons) in Zoology at the University of Aberdeen. She has completed both an MSc by research (looking at Leishmania) at the Ross University School of Veterinary Medicine and a taught MSc (Infection Biology) at the University of Glasgow. She is currently carrying out her PhD in Biophysics at the University of Exeter, specifically looking at Entamoeba toxins.